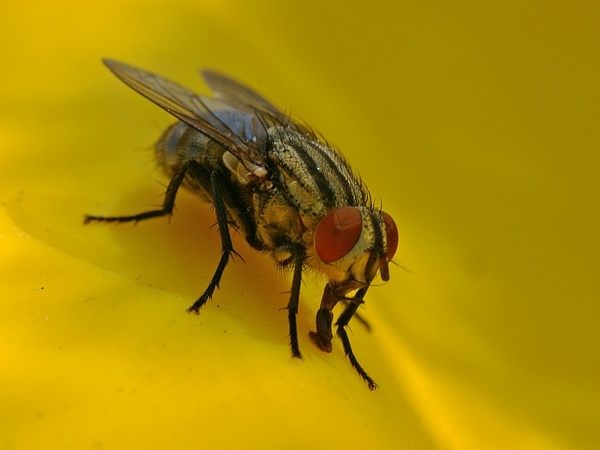 Flies in the family Sarcophagidae (from the Greek σάρκο sarco- = flesh, φάγε phage = eating; the same roots as the word “sarcophagus”) are commonly known as flesh flies. They differ from most flies in that they are ovoviviparous, opportunistically depositing hatched or hatching maggots instead of eggs on carrion, dung, decaying material, or open wounds of mammals, hence their common name. Some flesh fly larvae are internal parasites of other insects such as Orthoptera, and some, in particular the Miltogramminae, are kleptoparasites of solitary Hymenoptera. The presutural bristle is located lower than the notopleural bristle, and closer to the notopleural bristle than to the outermost posthumeral bristle. The presutural bristle is located higher than or level with the posthumeral bristle. The hindmost posthumeral bristle is located even with or toward the midline from the presutural bristle. Four notopleural bristles are present and arranged in the order – short, long, short, long – from front to rear.